Today cars the sensor of level of fuel is regulated by a specialist using a computer and special software. Domestic cars and old cars have a simple adjustable design of the fuel sensor. Therefore, if the pointer of level of fuel will start to lie, just adjust it. If the tank car is full, drain off 10 litres of petrol. Get to the docking socket of the fuel pump in the tank. Depending on car design, to do this, remove the trim, remove the rear seat, steel sheet protection of the fuel tank. From the pump disconnect the connector with the wires. The gas cap open to relieve the pressure in it. Put absorbent materials in order to avoid the Strait of gasoline on the floor and interior trim, as it can damage the coating. Carefully relieve pressure in the fuel hoses. To do this, one key loosen the tightness of the fitting, while others hold the offset from the nut of the high pressure hose. Do not confuse them, otherwise spill the gasoline can not be avoided. 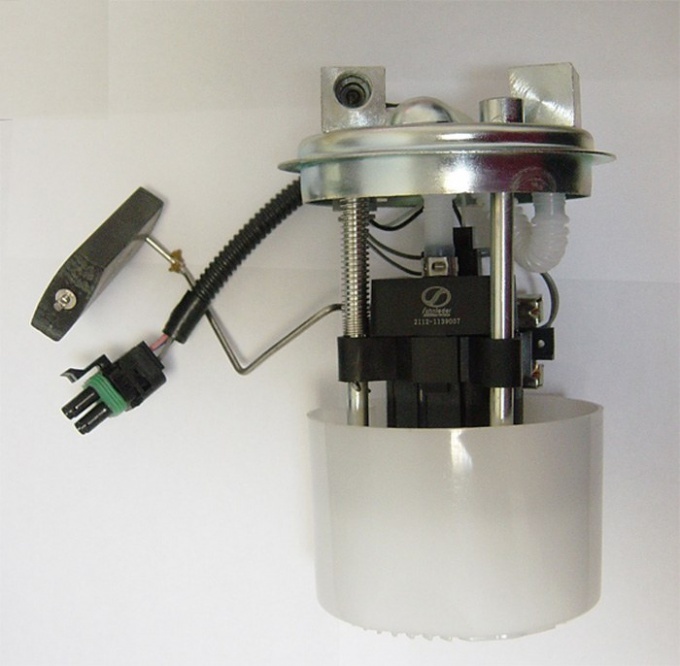 Unscrew the fasteners of the fuel pump and remove it from the installation slot. Depending on the method of fixing the pump turn off and/or remove in upward direction. Wait until the remnants of the gasoline will not merge mesh filter. Then plug the connector to the pump and turn on the car ignition. Watching the gauge of level of fuel, pull the float needle in the extreme position until it stops. Indication arrow pointer should change from the level "0" (empty tank) to the level of "1" (full tank). If one of the end positions of the spokes, the arrow pointer will show the wrong amount of fuel, adjust the sensor, turning left or right adjusting the tabs so that the needle can move left, or right to its extreme position. After adjusting the fuel sensorand adjust the pointer. If you turn off the ignition and remove the dashboard. Disconnect necessary wires and the speedometer cable, remove the instrument combination and disassemble it. Removing the arrow pointer of level of fuel with its pin, connect all the wires to the dash without installing it in place. Again turn the ignition on and wait a pause of 5-10 minutes. Then the spoke sensorand put in one of the extreme positions corresponding to full in Baku. The arrow pointer is set to point exactly to the mark "1" and lock it. The fuel pump install in the seat gas tank and secure with the retaining nuts. Connect harness connector and fuel high-pressure hoses. Fitting tighten with the required effort. Refill the gasoline tank to the full level and mark the position of the pointer. If after all the adjusting procedures of the arrow is still not showing the correct amount of gasoline, again, remove the fuel pump and bend the needle of the float with two pliers. Some hold the needle at the base, and other podhisita. Repeating this procedure repeatedly until the arrow points to the mark "1". Then turn the ignition off and collect all the removed and the disassembled parts.